Found in a bag in which I had kept winterberry (Ilex verticillata) leaves over the winter. The leaves contain Rhopobota (Tortricidae) larvae/pupae, which I am trying to rear, as well as mines of a Phytomyza species--so the host could be either one of these. One of the flies has also emerged as of 4/28/10. Please let me know if other views/details would help with ID. Determined January 27, 2012 by Robert Kula, Systematic Entomology Laboratory (not sure why it took over a year for this to be conveyed to me). I've edited my remarks to reflect the fact that more than one Phytomyza species are now known to mine in Ilex verticillata. The mandible appears to be of the exodont type, so I would suppose this to be an alysiine braconid and, hence, having likely emerged from the Phytomyza. 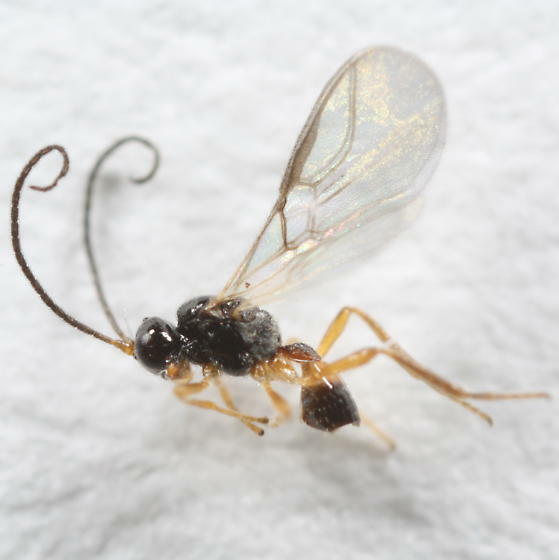 In the host index of the 1979 catalog of Hymenoptera in America north of Mexico, P. verticillatae isn't listed, but several other species of Phytomyza are, and while some reference Opiinae, none reference Alysiinae. There are at least two separate fly mines and only one fly has emerged, so that makes sense. I will hang onto the specimens (both wasp and fly) in case anyone wants to properly document the new host record. The parent wasp must have oviposited in the egg of the fly, because the mines didn't appear until several days after I placed the leaves in the bag.